Within Teamwork Projects, you can add people to your site as users or contacts. When you invite someone to your site so they have a username and password to log in, we call them a user. You can control what they can see and do in each of your projects. In the list of users, you can use the quick search box to find a particular person, or use the letters to filter the list by first name initial. This also shows a breakdown of the total number of users on your site. The Invite Users button in the top right allows you to invite people as users to log into your site and interact with the projects you add them to. This is a quick way to invite multiple people at the same time, add them all to a particular set of projects, and write custom messages they will all see in their invite email. 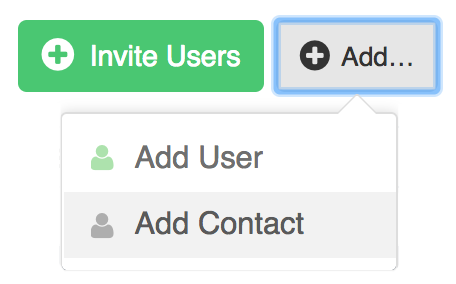 The + Add option lets you add a single user or contact, and fill in all of their details at the same time. 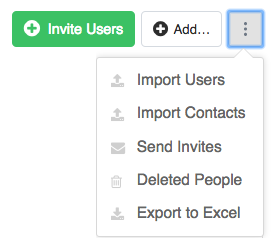 The Options (three dots) button gives you import and export options, access to the deleted users trash can, and the option to manually send user invites. You can also add people to your site as contacts. Contacts are simply a point of reference. This means that you can keep their details on record, associated to your projects, but they won't have a login for the site and they won't be able to see anything or be assigned tasks.